First, I feel it is important to say that the US is getting away with claiming they are withdrawing from an agreement – it was not an agreement. The Joint Plan of Action was not signed, nor termed a treaty or agreement because that could never be submitted to the US Senate. It was very deliberate. A deal was agreed between countries and given its legal binding force by the Security Council. This deal then became binding not only for those that negotiated it, but the whole of the UN under force of Article 25 of the UN Charter. The Iran Deal is a legally binding decision of the UN Security Council, not a multilateral agreement between six countries. The US declared it will no longer abide by that decision. Therefore, it is violating it illegally. They haven’t stopped there – they are urging other countries to violate the decision and impose sanctions on those who do not. This is an extreme position of ignoring the World Order as it was established. I am somewhat pessimistic on the Iran Deal because I think the US is so strongly influenced by its links with Israel and Saudi Arabia. I don’t know whether I have sufficient basis for the thought, but I think that Israeli Prime Minister Netanyahu and the Saudis fear Iran as a stronger power in the Middle East. They worry about the economic expansion of Iran; that Iran will develop a more diversified economy. And they want to hinder that. My hunch is they want to use sanctions as a way of holding back the Iranians and that they are, in fact, less worried about the nuclear issue. Nuclear in the case of Iran, as in Iraq, serves as a mantle, as a label or subterfuge for their action. I don’t think it is legitimate to try to hinder a developing country from economic development, I don’t agree with such a policy. I think it is good if the Iranians get a better deal. Signing of Ivory Coast NPT Safeguards Agreement, , Vienna, September 1983. On nuclear, you say we are taking steps in the wrong direction, and the overview you give is that space for solving any impasse is limited. You mention important work still needs to be done. Is there a role for civil society, for organisations such as the ELN, to influence governments? The ELN is a highly desirable network, a virtual think-tank different from many others. We always need to listen to the periphery, and it is the duty of the periphery to try to be active and not just sit and listen to the wise words of the big states. I think that the ELN has a role, and in the US, that Global Zero has a role. On disarmament, it is dependent on the political climate. It’s doubtful that the US-Russia strategic arms reduction treaty (New START) will be extended. On de-legitimisation, I think it is very important at a time when nuclear states are sharpening their nuclear profiles that civil society is fighting back. On what could change the situation, I am slightly more optimistic but it is complex. We say that each state is free to decide on its security policies and while this is true, it is a little disingenuous. I don’t think that Mexico or Jamaica feel entirely free to move in security policy irrespective of the US, or that Vietnam is free to ally with whomever it wants. Everybody has to tread a little carefully with their neighbours and with their concerns. You mention neighbours; a key challenge in European security at present is the declining relationship between Russia and the West, what are your reflections on this? I think the substantive differences between Russian and Western interests are not so great. Gradually increased corruption and autocracy are features we regret and think are very sad, they are bad for Russia and for economic development. Nevertheless, we lived side by side during the Communist era. We should try to get back to that. We are all interested in facilitating economic development in Russia. There is interest in Europe in Russians having a better life. Russia is coming up from a difficult period and we were perhaps naïve in believing they could change quickly into a liberal democracy but we shouldn’t be smug with them. They have a cultural system that is admirable, an intellectual system that is admirable, and we should gradually try to edge back to co-operation. I do not see the Russian expansionism in the way that some fear. I don’t think that the Western world should recognise the annexation of Crimea. I think it should remain non-recognised as a frozen conflict. However, it is clear the Russians are not going to leave Crimea. Ukraine is an area in which the interest of the European Union was overlapping with Russian interests and it awakened a fear. Greater efforts should have been made to address these concerns. This brings us to another turbulent relationship, that between Russia and NATO. Could you share your thoughts on managing risk within this dynamic? Everybody knows that Ukraine will not become a member of NATO. But who dares to say it? Very few. I think a former head of the European Union did on one occasion, maybe others, but very few. The Secretary-General of NATO cannot say it, and President Trump cannot say it. I have a lot of respect for NATO but I do think that its expansion is a move back to bipolarity and I don’t think that is desirable. You have to ask, “What is the necessity in having Albania or Montenegro in NATO?” It was created to protect the North Atlantic. Then it moved to the Black Sea. When is NATO going to move to the Caspian? That is my question. I look to the Europeans to find a way out of this because in Europe there are many countries eager to get out of the present difficulties. Italy and Southern Europe generally, but also the Germans, who skillfully resolved the East-West issue. For the US, it is a different matter. Trump is suspected of being soft on Russia, and the establishment have become very anti-Russian. This is categorical in terms of sanctions and NATO actions. The anti-Trump line has strengthened that. We often hear of a crisis in the international rules-based order and of an undermining of independent international organisations, what are you views on this? I think it is valuable and important that the European Union and Europeans in general stress the importance of the multilateral system and the primacy of the UN. I don’t think the Russian position is negative toward it. They are suspicious of Western organisations and NGOs because they claim they have been used in the past by intelligence agencies for infiltration, but they are not the only ones. These concerns are not new, but of course everything is on a bigger scale now. So where is the distinction? The line of difference between permissible, mutual influence on the one hand and inadmissible intervention on the other. This is a problem and it can be very hard to define, but it’s an acute one we see most in our international system and it needs to be addressed. In your view, what can we do to strengthen the international organisations we have created? How can we strengthen the integrity and independence of information coming from them? First, you should have the activities of our international organizations on a regular budget. You should not have voluntary contributions. That is a facile way of getting operators working – you can have the US, Japan, China, or Russia say they are willing to make a voluntary contribution and another say “No we won’t pay for that”, but it will still go ahead and be accepted. This gives power to the one who pays because if you have one contributor you can be sure they have certain leverage. One can get quite a lot for payment to a joint operation, and that could influence the integrity and independence of action. Another issue is that the boards of governors for these organisations should be sharp on demanding transparency, to the extent that confidentiality is not breached. This can be justified in safeguards. It is the tradition and the attitude of an impartial organisation that is vitally important. In the International Atomic Energy Agency (IAEA), there is no veto so the board can play a greater role. 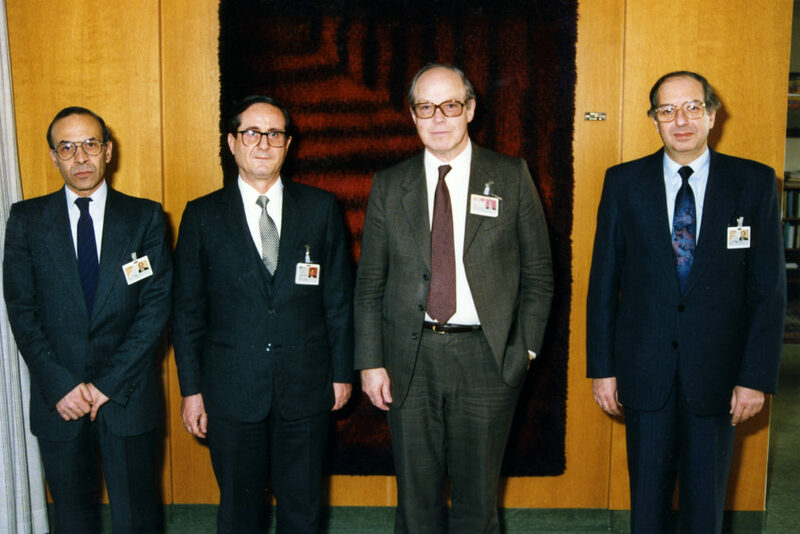 If the US had had a veto in the IAEA, then Muhammed El-Baradei would not have been re-elected – Boutros Boutros Ghali was not re-elected in the US Security Council because the US objected to it – so I think Europe should stand for the need for the impartial world organisations. One more point, and I will use the example of inspectors. Europe, and the world, has strong reason to defend the independence of inspectors. Intelligence agencies will seek to infiltrate and influence everywhere. That is unacceptable. The world, much like individual countries, has a need for civil servants, a need for personnel that acts on behalf of the international community. We have a need to be impartial, to be credible, and to be acceptable. This is an important line to maintain. Signing ceremony with Syria on comprehensive safeguards agreement with the IAEA. Vienna, February 1992. Following that point, IAEA inspectors have again announced that Iran is complying with the terms of the nuclear deal; there are some parallels to be drawn here with your time as head of the agency. With this in mind, what advice do you have for members on lessons learned both on the capacity of inspection and on protecting the integrity of an international body? The IAEA under my stewardship in 1997, and under Muhammed El-Baradei in 1998, came to conclusion there was not a significant installation of material through which Iraq could go for a nuclear weapon. This was also the view of the State Department in Washington – Iraq could not do anything in the nuclear field. I used to talk about the four runners: the chemical, biological, missile and nuclear. I felt, and preached at the time, that as soon as one runner has cleared that we should recant. That is to say, “Nuclear is now clear and that dossier is closed”, but the US took the view that before we can say that, all four runners must be there. The background to this of course was that the US wanted to have a rationale for a policy of regime change. They were not satisfied with eradicating the weapons of mass destruction. They wanted a reason for regime change – That also applied to the Clinton Administration. We were warned explicitly by the US, “Don’t go ahead and say that there is nothing left. If you do, we will discredit you in the Security Council.” They had an interest in inspectors not saying there was a clean slate. As an intellectual point, inspectors can never come to the statement that there is nothing. Proving there is nothing is near impossible. If you ask a Police Chief in London, “you have all the power to combat narcotics, so will you now give us an assurance there is no narcotics in London?” I don’t think they can. The end conclusion is for the state to take a political decision, to draw a political conclusion that it will act on the assumption there is nothing. Going back to Iran, the Iranians have shown a proactive attitude. They have been very co-operative and have gone very far in the kind of inspections that they have approved. There will have been some restraint, but what independent government would accept free rein and movement in their most sensitive military establishments? I think that some restraint is understandable. You have to assess: Are they pro-active? Are they as co-operative as one could expect? I think they have been. Dr Blix, you have a long and distinguished career, we have talked about everything from diplomacy to modern-day cyber (in)security. Do you have any broader reflections from this career, and thoughts on what it means to be a successful diplomat? I have two reflections. One is specific and the other general. The specific relates to the recent cases of the use of nerve gas, nerve poison, Novichok etc. I think that without taking a stand on actual evidence, that strong reactions against that kind of behaviour, whether it is the Russian state, Secret Services or whatever behind it, are justified. This type of action should be condemned and that applies to the cruder form of cyber warfare, too. I understand that actual engagement of this is difficult to prove but nonetheless, these are kind of activities in the world are those that we really should condemn strongly. 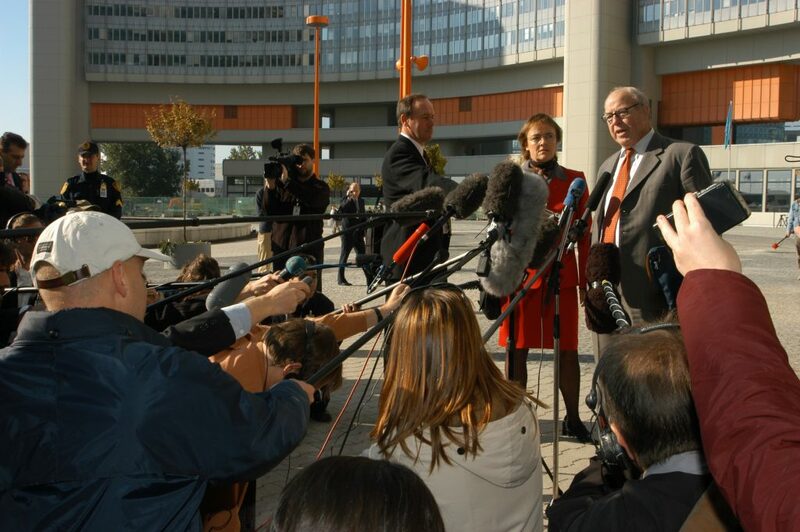 Executive Chairman of UNMOVIC, Dr Hans Blix, briefs the press during the two day talks between IAEA, UNMOVIC and Iraq. Vienna, Oct 2002. Second, my general reflection from a long diplomatic life is one I always come back to: the importance of avoiding humiliation. I think diplomacy is sometimes associated with exaggerated courtesy, crystal chandeliers, and what have you, but that is not the essence of it. The essence of diplomacy is first to improve relations between States and groups, to make them better, and more profitable. The second is to avoid hitches, to avoid exacerbations and conflict. And third, when conflicts arise, to mitigate, reduce, and solve them. Though not all conflicts can be solved by diplomacy, and I accept that. The point I am trying to get at is, in all situations do not humiliate the other side because you don’t get anywhere; you make them furious. There are many examples of this, even in vocabulary. When trying to reach solutions try to use dry concepts and avoid loaded words. This is important. In human relations, humiliation is very dangerous. Diplomacy is a fundamental attitude to life. It is a philosophy that says we can all live together and when people ask me how you can train for it, I say, “Start at the kitchen table with your wife, with your children… don’t humiliate, don’t ever humiliate.” I think it is underestimated how important dignity is between people and how important it is not to humiliate. Dr Hans Blix, I thank-you again for your time and hospitality, and for your continued engagement and support for the European Leadership Network. Previous PostAirbus – Setting Some Records Straight! By Howard Wheeldon, FRAeS, Wheeldon Strategic Advisory Ltd.Next PostBrexit – Small Signs of Hope? And Fears of EU Integrated Defence Plan By Howard Wheeldon, FRAeS, Wheeldon Strategic Advisory Ltd.